As the leading Latin dating site, and an integral part of the Cupid Media Network, LatinAmericanCupid has more than 3 million registered users. It attracts thousands of members to use their services every day making it one of the most visited dating platforms that cater to Latin singles. You can access it from all around the globe using eight different languages and search for anything from friendship to long-term romantic relationships and marriage. 40% of all male users do not have Latin origins but have a preference for Latin partners and find this site useful in getting in contact with them. 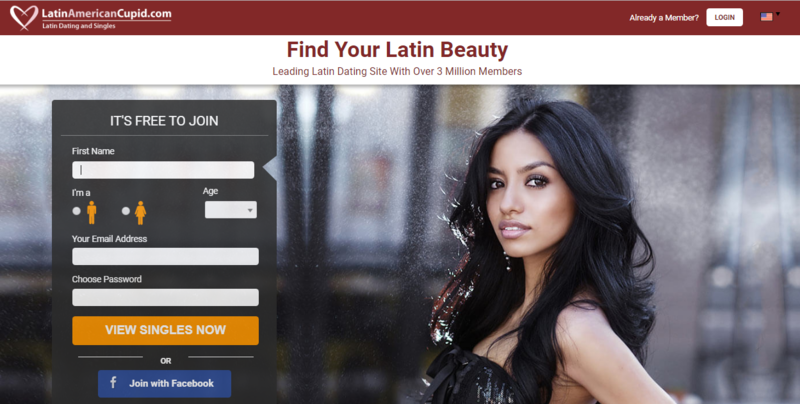 LatinAmericanCupid has made all the site’s essential functions available for free members, but it offers Gold and Platinum memberships as well. One of the site’s strong points is the fact that it creates comprehensive profiles that cover everything you might want to know about another person. Users fill in questionnaires with extensive information on their physical appearance, lifestyle preferences, personality features, hobbies, languages they speak, and so on. The questionnaire section on “Favorites” makes an exceptionally popular reading for many members. It includes answers on favorite book, movie, pet, colour, article of clothing, type of shoes, etc. Future members also write about their hairstyle, whether they have tattoos and what kind, whether they wear glasses or not, and what their body measurements are. They can include information on what kind of jobs they do, what their monthly income is, what religious denomination they belong to, and so on. It’s also preferable to write a short essay about yourself in which you can display your sense of humour and emphasize some of your best personality features. This allows other users to get to know you more thoroughly than they ever could by viewing your photo album and reading your basic characteristics. This forms a solid basis for a meaningful relationship which has more chances to last than those resting solely on physical attraction. A downside to having a detailed profile is that 99% of users will not read it carefully. You run a risk of having the most important thing about you get lost in the pile of trivia the site asked you to provide. One way to avoid this trap is to use CupidTags. What this means is that you use several keywords that make a strong statement about your personality. Along with your profile picture, these will be the first things members see when they open your profile. Some of the frequently used tags include “smart”, “optimistic”, “independent”, and “open-minded”. CupidTags can also be used as search criteria to look for members with similar tags as yours. An alternative way to emphasize your profile is to add a video message. Recording it doesn’t require any sophisticated software. A simple webcam with a microphone will suffice to film a video that will accompany your profile. Hearing the tone of your voice and seeing your smile adds a more personal dimension to the way other users will perceive you. However, this will only be visible to paying members. To complete your profile, you will need to fill in the “Match Info” section to provide information on the type of partner you’re seeking. This lets the site come up with matches that correspond to your criteria. You can enter any number of those as your search preferences, including height, weight, occupation, children, pets, and so on. LatinAmericanCupid will use these preferences as filters to create a list of possible compatible partners. This site prides itself in offering quite a few options for searching their database. These range from searching for new members, those that have recently added new photos or those with a video gallery. Advanced search options include searching by keywords or any profile element a user has entered. Search by CupidTags is also enabled. Many features of the site remain open to all members. However, if you wouldn’t like to miss out on anything this dating platform has to offer, subscribing to a Gold or Platinum membership might be the answer. Perhaps the most important thing free members cannot enjoy fully are communication opportunities. They can send e-mails to all members, but they can only read mail from paid members. Free members have to choose the mail’s subject from the ones provided in the drop menu and are not allowed to enter a personalized subject. Only Gold and Platinum members have the option to send audio and video messages. Subscribers to Gold membership can use instant messaging, watch videos featured on some profiles and get their profile ranked higher. They can read e-mails from free members and let non-paying members read their messages. In addition to that, Platinum membership allows users to send and view audio and video messages and get their messages translated into another language should they require that particular service. Being able to get practical information about travel and safety in Latin American countries. Some countries may be entered only with a valid visa. LatinAmericanCupid can help arrange your travel and facilitate obtaining all the necessary documentation. Health issues are also given some consideration. You’ll be able to read about required vaccinations and any health risks you might run when going to a particular region. The site provides instructions on safe money transfer to Latin America and what to beware. A map of time zones is also a feature of this site so you can quickly determine what time it is in your dating partner’s area. That way you won’t run a risk of coming across as inconsiderate when you video-call them at 4 AM. It will also prevent you from stressing about your date not answering your text right away when you realize it’s the middle of the night where she lives. Whether you’re just looking for a travel buddy to accompany you on your Latin American adventure or a romantic partner to share your life with, LatinAmericanCupid can help you. No possibility for unlimited communication between free users. Messaging is one of the essential and most important features of any dating service and only paid members can enjoy it to the fullest on this site. Prices vary on the time period for which you buy your subscription. A single month’s subscription to Gold membership will cost you $29.99, but if you decide to purchase a year’s subscription and pay in advance, monthly fees only amount to 10USD. Platinum membership is slightly more expensive. Its price is $34.99 for a single month, with the monthly fee dropping to 12.50USD if you agree to get billed for the whole year in advance. Within the three months’ and six months’ memberships, monthly costs are 23.33USD and 20.00USD respectively. As it is customary with most subscriptions, they renew automatically unless you cancel your subscription at least 24 hours before it expires. LatinAmericanCupid is a site catering not only to Latin singles but also people of all kinds of cultural and ethnic backgrounds interested in dating Latinos and Latinas. Its members are predominantly men (80 %vs. 20% women), but with a total of 3 million users, there are still plenty of gorgeous ladies to choose from. People of Hispanic descent join this site for two reasons: they either wish to date people with similar background and way of life, or they would like to marry abroad. With around 40% of the site’s male members being of non-Latin descent, the latter is also an easily attainable goal. Registration is simple, and you can even join using your Facebook account. Alternatively, you can sign-up via your e-mail address. All the information new members enter into their profiles along with the photos they upload are subject to revision by the site’s team of dedicated employees. This lowers the chances of fraud and makes sure that members do not use celebrity photos instead of their own. It also gives the profiles credibility as you can trust that those who pass the control team’s scrutiny are created by persons genuinely looking to meet a special someone online. The messaging system is quite straightforward. Free members can only send messages to Gold and Platinum members since texting between free members is a locked function. Non-paying users have the option to initiate contact with each other by using the “Show interest” function or by creating a list of favorite profiles and adding people to it. We would give the profile quality a respectable 4/5 grade. Completed profiles are quite detailed and enable interested parties to gain an excellent insight into what a user is really about. Unfortunately, not all registering users make an effort to finish their profiles. Their profiles remain sketchy and leave a lot for personal communication. Another good thing about this site is the absence of pop-up ads. There’s nothing to distract the member or make their experience using this site an unpleasant one. The site’s mobile app, available for free download on Google Play Store, enables staying connected with your Latin dates even when you’re away from your computer. LatinAmericanCupid application is currently not available in App Store, which is a real bummer since many potential members come from the US and use phones with iOS. In case a registered member no longer wishes to use this website, they can delete their profile from the site’s database. If they later choose to reactivate it, all it takes is to fill in the Request for Membership Reactivation form and wait 24-48 hours until the reactivation is approved. In this review, we aimed at covering all the main areas that could interest a possible user of this particular dating site. If you still have some doubts or uncertainties, feel free to contact the LatinAmericanCupid support team.